Exude elegance and feminine grace carrying the gorgeous 'Giselle Shopper Media' bag by Furla™: link . 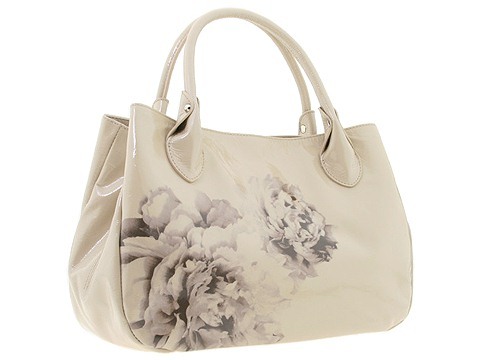 Shopper style handbag made of light weight crinkled patent leather with floral stamp. Holds your wallet, sunglasses, lipstick, personal technology and a copy of your favorite magazine. Dimensions: 13 1/2 wide across bottom, 13 1/2 wide across center, 13 1/2 wide across top x 5 1/2 deep x 9 high. Dual handles. Handle drop: 5 length. Fascinating flower decorated front. Platform bottom with feet to protect bag when set down. Inside magnetic snap closure. Furla jacquard interior lining with a back wall zip pocket and multifunctional slip pockets. 20.00 oz. Free shipping in the USA.